I usually prefer reading books, but I have about a 15 minute drive to work which over time adds up to a lot of wasted time listening to the radio. A few years ago I listened to Steven King’s Dark Tower series, which took me over a year of trips to work. After Robert Jordan died and his Wheel of Time series was finished up by Brandon Sanderson, I revisited the books I already read on audio as I didn’t want to dedicate reading time to catching up, then read the new ones. 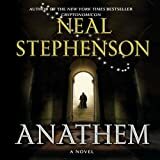 This time I wanted ONE book, not a series so I after some digging around I came across Anathem by Neal Stephenson. I’ve previously read Snow Crash, The Diamond Age, and Cryptonomicon. I really enjoyed Snow Crash and The Diamond Age, however Cryptonomicon was insanely long. I about half way through, I started to feel fatigued and found myself just looking forward to the end. Given the length of Anathem, I knew I didn’t really want to dedicate that amount of reading time to the book. I normally read about 15-20 minutes a day during my lunch break at work, so it would have taken forever for me to finish. The audiobook format seemed like a good fit. In the end, it took me about 2 months to make it through the 32 + hours. I was very pleased with the narration by William Dufris. Each character had a distinct voice which really was beneficial because bulk of this book is dialogue. There is an intro with a spoiler warning that I didn’t bother to skip over. It mentioned that there would be just minor spoilers, of which I couldn’t remember when the time came anyway. I recommend just reading it. Each chapter starts off with a definition of a word that may or may not be an English word from our world. Some of these definitions are read by Neal Stephenson himself, and others by Oliver Wyman and Tavia Gilbert. The definitions usually set up some type of event in the chapter which breaking out to define the unfamiliar word would just bring the experience, whether reading or listening, to a stop. I saw several reviewers complain about the format of the book, or even the fact that definitions were needed. It took me a while to get used to the new words, but eventually I just took them in naturally, which was good because of the insanely long length of the book. Neal Stephenson created a vibrant world, more detailed than just about any other standalone book I’ve read. He goes into explicit detail describing the characters, landscape, technology, history, metaphysics, and philosophy in the world of Arbre. At first I was a bit annoyed at the extremely detailed descriptions of everything, and just wanted to story to get moving along. For example, when the book first started, Stephenson seemed to spend an unusually long time describing the workings of the clock tower in Concent of Saunt Edhar (think Monastery) where the story begins. The opening is very slow and detailed, but it paid off because toward the conclusion I realized that I was attached to this little world that Stephenson created. It is hard to describe the conflicting feelings I had toward the end of the book. I wanted the mysteries to be revealed and experience the ending, but knew I’d miss listening to the book on my daily drive. I’m very glad I listened rather than read, because otherwise it might have taken me 6 months to get through it! For those reading or listening, expect the pace to pick up about 2/3rds of the way through the book (2 normal length novels) for the “action” to really pick up. That might be a turn-off for most people, but depending on how you like to read (or listen) to books, just keep that in mind. A large portion of this book is dedicated to long philosophical “dialogues,” as the main character refers to them. These can get a bit drawn out at times, but normally push the plot along in some way, however subtle at times. I think that is why this book can be so long with not really a whole lot of plot happening. I can imagine how frustrating that could be for a reader, but since I was just listening, I found myself zoning out from time to time, not particularly caring to skip back and start the dialogue over. I seem to recall giggling at an exchange that went something like this. Conversation, conversation….. “Oh are you engaging me in a dialogue? In that case….” where the dialogue gets more convoluted. If you can get past the insane length and the quirky made up words, I think most people would end up liking this book. If you don’t want to learn new vocabulary that will serve no use outside of this book, you might want to pass.